Many people choose to specify any wishes they may have for their funeral to avoid any worry for their family and friends at a difficult time. 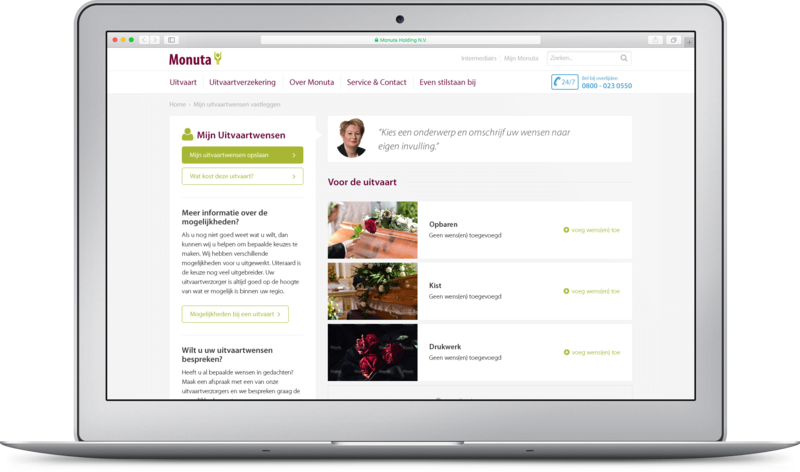 Monuta has an online tool which helps people to specify those wishes. 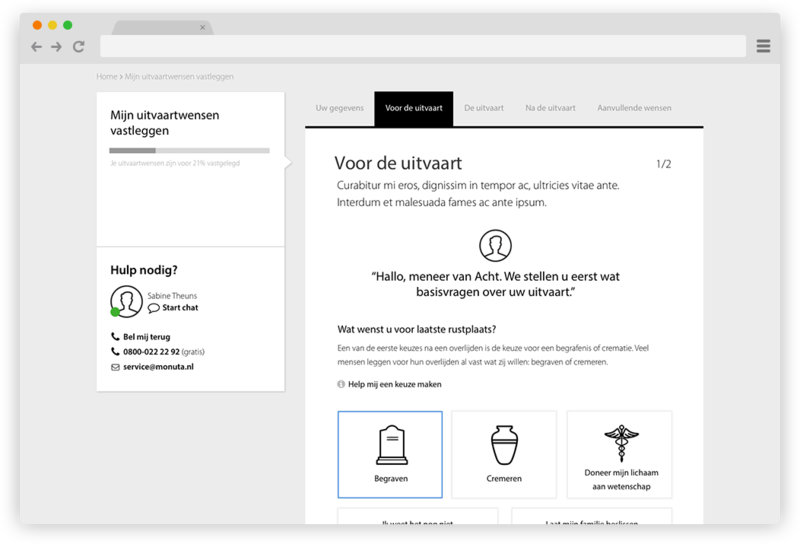 They asked Lukkien to rethink and redesign this online tool to make it more engaging and user-friendly. 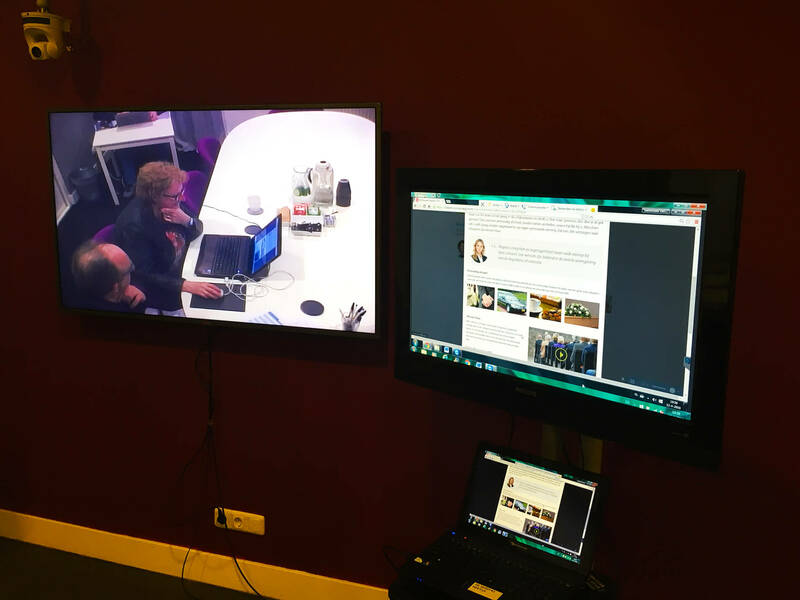 During the project, numerous stakeholders were involved. It was important for us as an agency to listen to all the needs of the stakeholders. To generate as much useful input as possible we did a brainstorm for the online tool. Later that day our team made a rough visual prototype to immediately gather feedback on the initial direction. For this project it was inevitable to get a sense of the context the user is in when capturing funeral wishes. We defined a number of points that should define the final user experience. Detailed or high level wishes? We got the task to think about a detailed and high-level flow, since the stakeholders of the project wanted to provide both these options to the user. We literally offered two routes to the user, without giving them the feeling of missing something out. What type of wishes are there? Out of research and analytics we understood that users have all different type of wishes. The most common wishes are those about flowers, music and the appearance of the coffin/urn. But since we had two flows (detailed/high level) it was important to think about what and how to describe certain wishes. Something that’s really important for the target group is (micro)copy. The slightest nuance is important to understand what’s being asked. We thought about the difference between capturing or saving the wishes, because they both meant something else to the target group: capturing felt very definite. 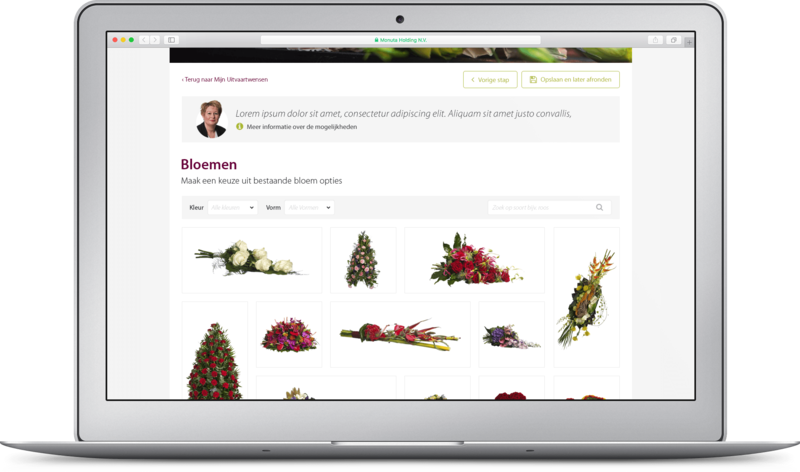 The landscape of capturing funeral wishes is so much more than just an online tool. The user has a lot of questions. What if I go to another insurance company, will I still keep my funeral wishes? What if I want to change my funeral wishes? 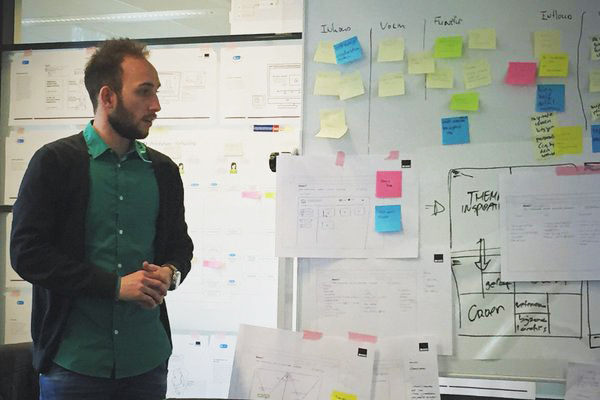 We had to think about all these user scenarios in order to create the perfect user experience. 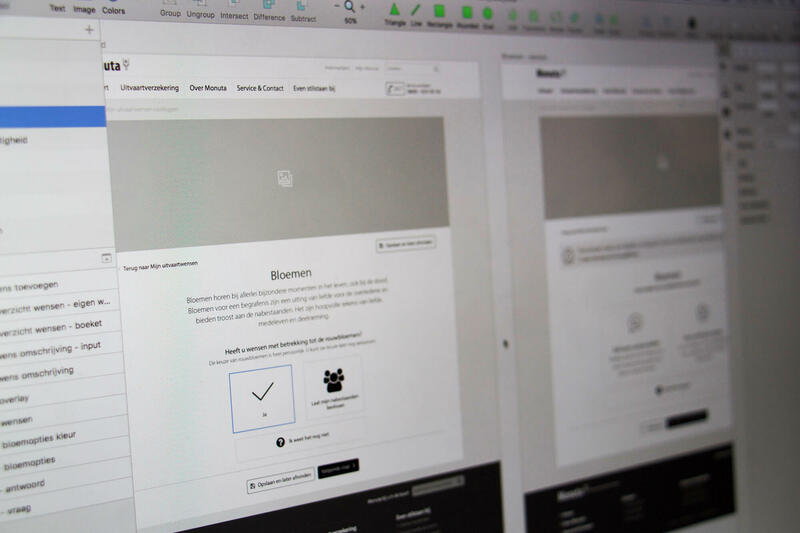 Since we were asked to come up with a redesign we also got the chance to improve the current user flow. The decision between burial or cremation turned out to be an essential one to make sure the next steps are adapted to this. 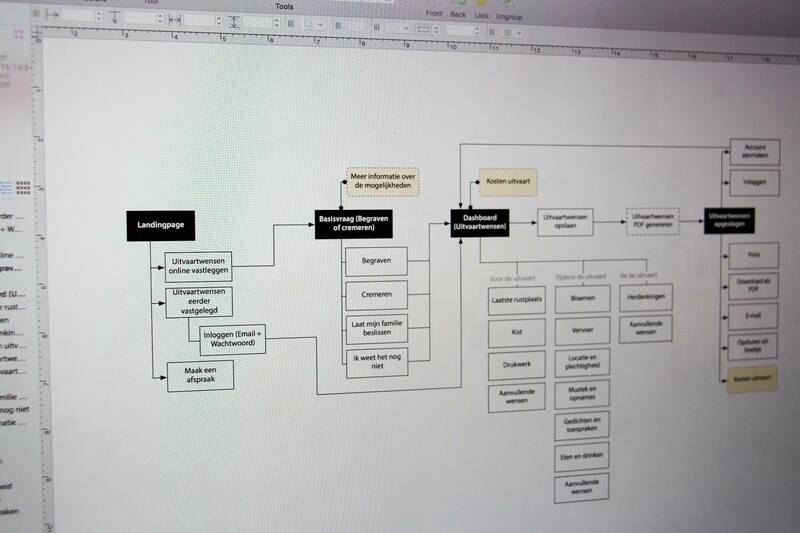 With input from the stakeholders and user research we could easily set up the first high level flow for the tool. This helped us to become less abstract in the process and come up with concepts in an early stage. With all the input from the stakeholder workshop, research and analytics we defined a few concept directions. 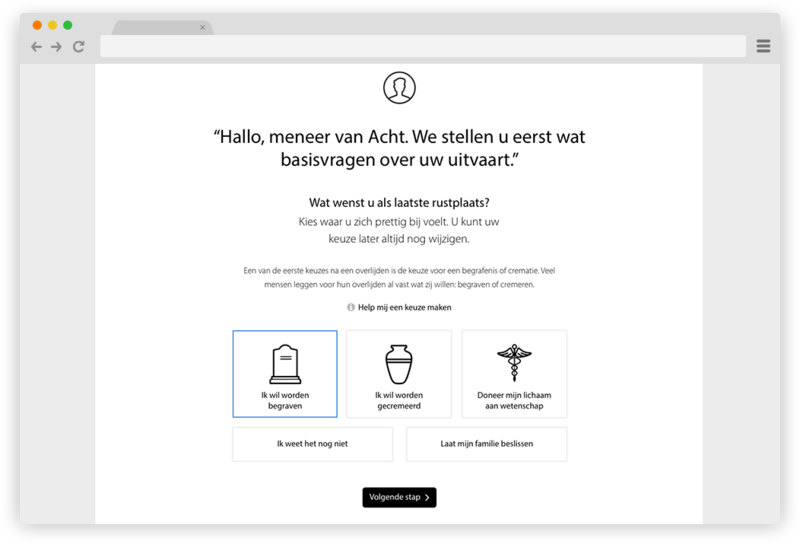 This concept was about adopting the funeral wishes folder of Monuta, which uses the steps of before, during and after the funeral to define the wishes of the users. We looked at ways of adopting the same pattern for the online tool to create recognition and clarity. We also created a concept which was more about focus and service. 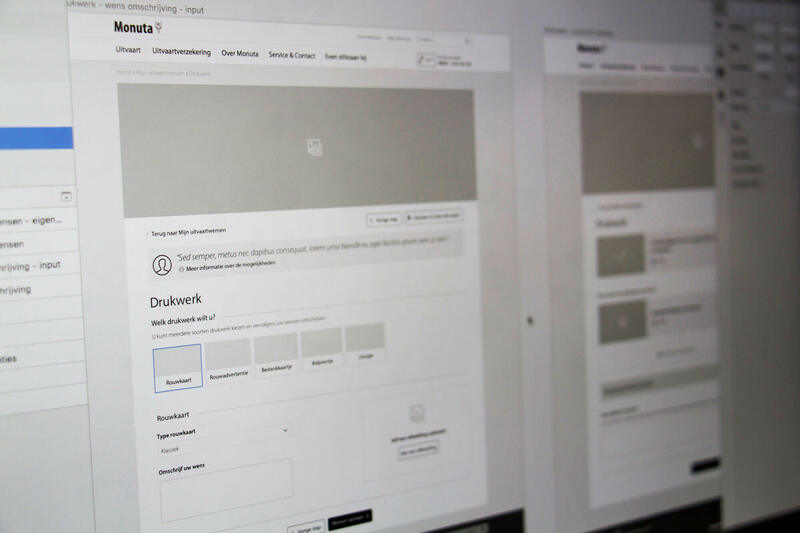 By minimising the distraction in the interface we thought of ways to engage the user via a dialogue with a Monuta employee. The client was happy with the presented concept directions and decided to try out the best of both concepts. The chronological steps felt natural, but limited the inspiration for the user. Based on the client feedback we started working on giving the experience more detailed interactions. 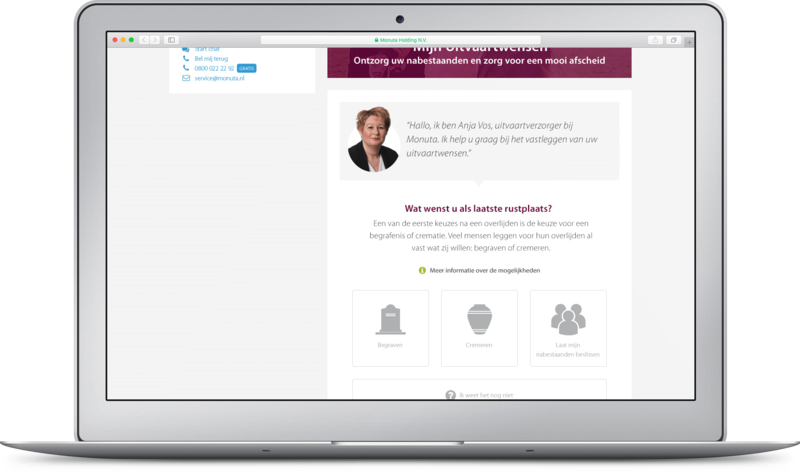 Once we felt that the overall flow and interactions were done, we did a very pragmatic concept check with real users. Thanks to the user feedback we did some major improvements on the design. We removed everything that even caused one moment of confusion. 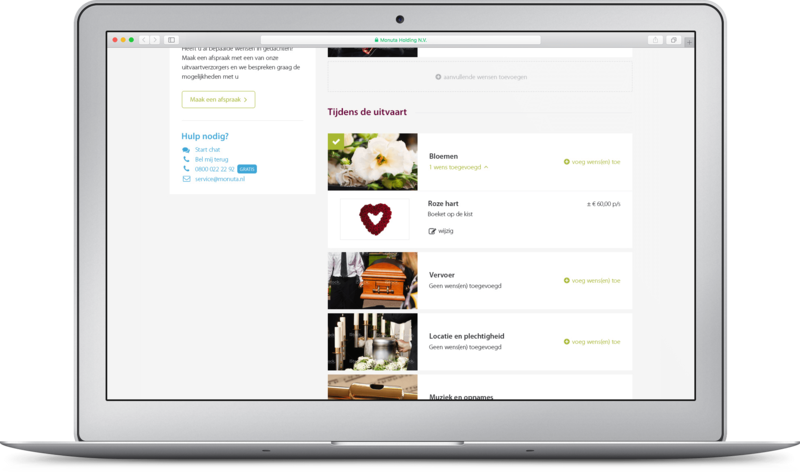 Users also told us that the task of capturing funeral wishes is mostly a functional one, although we thought it was a more emotional one. We used this feedback to make the design more task oriented. 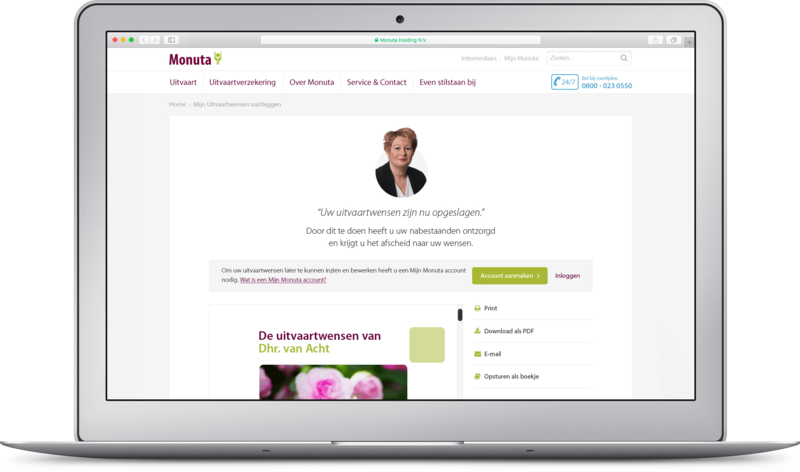 When the tool is used for the first time, the Monuta employee will guide the user through the whole process of capturing the funeral wishes. In the first concepts we also asked for whom the wishes are for, but this seemed very confusing for the user. That’s why we start with the question if the user would like to be buried or cremated. This seems kind of harsh at the beginning, but user research showed that being straightforward relates more than putting a lot of emotional communication into every single task. 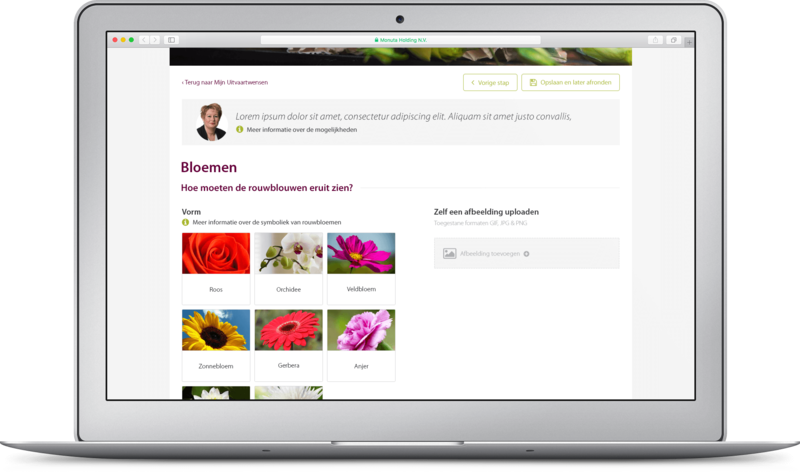 The dashboard is the core of the online tool: this is where all the wishes are stored and the homepage for the user. 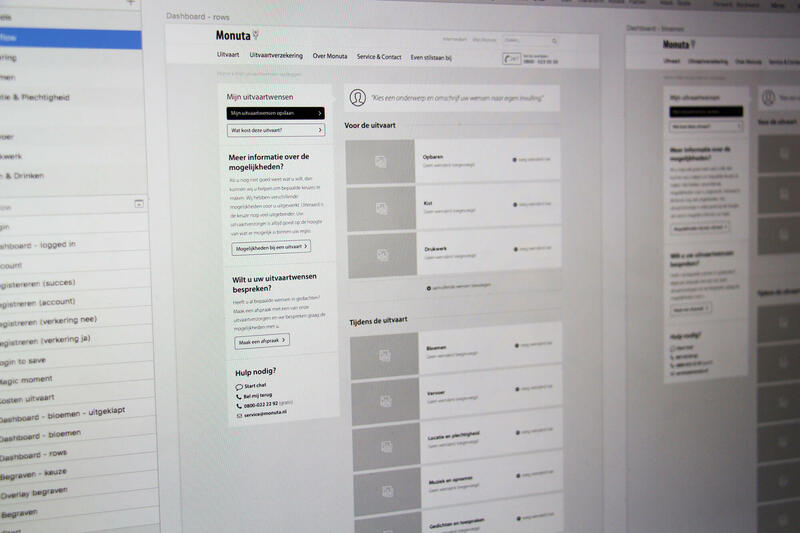 During the design process we first had a dashboard that existed of thumbnails, but later on we realised that a list view was way more pragmatic and clear for the user. The list view could be used as some kind of checklist, since it’s very easy to scan the content. We had different design challenges for the detailed flow as well as the inspirational flow. The detailed view is more focused on making decisions on type and color in a quick and easy way, with a lot of room for own interpretation. The inspirational flow is a lot more about visual communication and showing the user all the possibilities. Saving the funeral wishes turned out to be a very interesting process. Feedback on saving the wishes is essential, as well as the final outcome. If the user decides to save the funeral wishes we very explicitly show that they are being stored and saved, one at a time. Once this process is completed, the user will be presented a PDF file with all the wishes. This PDF can be emailed, saved and printed. It’s also possible to receive it as a printed book. 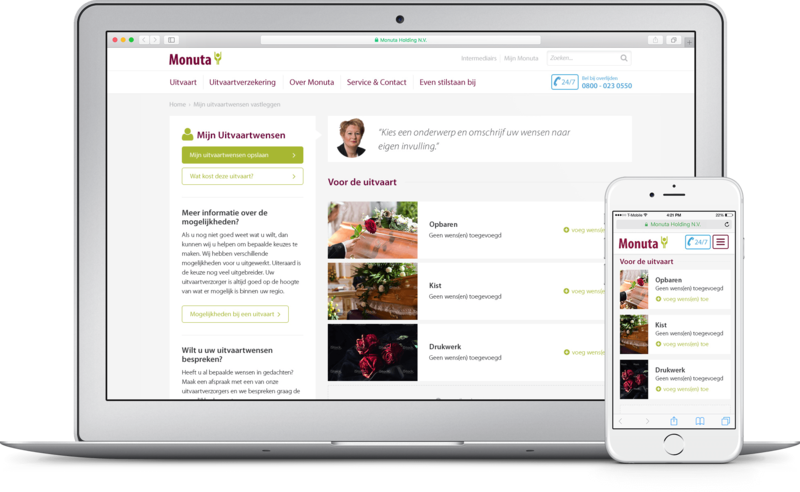 To view and edit the wishes at a later stage, it’s necessary for the user to sign up on the Monuta website.